It’s been two years since I had Verizon Fios installed, and overall I’m glad I made the switch from Dish Network. Originally I wrote this review after the first two months of using Fios TV. Now its been updated for 2009. Before ordering check out our Fios discount offer. Ordering/Installation: Ordering online is straightforward if your address qualifies for Fios service. You can select from the available installation dates and times. If you do not currently have Fios Internet, the installation will take 4-6 hours. It is possible to connect a TV with a built-in QAM tuner directly to the Fios TV service, without any set top box. However this method will be able to access the local channels (usually around 15 channels total). Verizon also offers a multi-room feature called Home Media DVR. For an additional $4/mo, a feature within the Motorola QIP 7216 is enabled to provide DVR access for up to 6 Motorola QIP 2500 and/or QIP 7100 set top boxes. If Fios internet service is installed, this upgrade also enables Media Manager, which allows photos and music from a home computer to be played on the TV. The packages are really simple compared to most cable and satellite providers, and the channel lineups are extensive. I like the fact that the basic package includes National Geographic Channel (also available in HD). With Dish Network, only the most expensive package has NGC. Any local High Definition broadcasts that exist are likely to be part of the Fios TV Essentials package. Local HD channels from a Dish or DirecTV are a different story. The newest setup boxes from the Dish and DirecTV are capable of receiving HD locals over the satellite feed, but the HD locals are only available in certain markets. In addition, in order to fit local market HD channels in the satellite feed, both providers are now using a more compressed MPEG4 stream, which often means lower quality. Of course with or without a service provider, most people can hookup an antenna to an HDTV to get local HD channels. The quantity of national HD channels neck and neck for the most out of all major providers. When comparing price, I don’t think any other service provider provides as many channels as Verizon Fios for a better price. Check our HD Channel Comparison for more information. Video On Demand: Fios TV offers an extensive library of free and pay Video On Demand selections. Free selections include programming from Discovery, Discovery Health, Animal Planet, National Geographic Channel, Travel Channel, MTV, E!, VH1, Music Choice music videos, among others. The satellite providers cannot offer such a large Video on Demand library. Currently over 14,000 titles are available through Fios Video On Demand. Over 1,000 selections are in HD. Again, due to the bandwidth of Fios, Verizon will continue to have a competitive advantage for VOD services. I would like to see them pair up with an online provider to provide even more selections for users. I’m just not sure how a company like Apple (iTunes) will provide their services to TV Service providers when it competes directly with Apple’s Apple TV. Quality: Standard definition channels are as good as it gets as far as I’ve seen. High definition channels are also as good as I’ve seen. Verizon will have a real competitive advantage over cable and satellite providers when it comes to picture quality thanks to the ample bandwidth that Fios can provide. Numerous HD titles are now available through VOD. This is only a recent addition, and a very welcome one. The only downside is a higher price for movies. New release movies cost up to $5.99 for HD. Purchased titles will be available to view for 24 hours. With any of the movie packages, you have access to the VOD selections provided by those channels. Most of the time I preferred searching for the title and recording it live on the HD channel in HD quality rather than playing it through the VOD service. Of course you may have to wait a while for the title to be played again on the actual channel. Now, a lot of the premium movie titles are available in High Definition through VOD. However it’s still not as many as the standard definition selections. Set Top Boxes: From my experience the Motorola boxes are considerably better than the Scientific America boxes provided by many cable providers. With that being said, I still had problems with the Motorola boxes, mainly the QIP 6416 with DVR and HD capability. Luckily the new Interactive Media Guide has made drastic improvements to the previous user interface. TiVo users will probably still prefer TiVo, but Verizon’s IMG is quite good. The IMG is unique to Verizon, so it will take some getting used to. The recording options are very effective. For whatever reason, I have had some missed recordings over the last 2 years, but not nearly as many I did with Dish Network. Like most DVR boxes, it allows you to record series in a certain time slot or only new shows (not re-runs). The most annoying aspect with the Motorola QIP 6416 and the new QIP 7216 is the small hard drive. It’s only capable of recording 80 hours in SD or 20 hours of HD. Of course you can mix and match SD and HD recordings. There is a connection for an external hard drive, but this feature has not been activated. Surely the media conglomerates do whatever they can to limit the amount of recording we can do. After all, one of the biggest reasons people want a DVR is to skip commercials. Luckily the Fios set top box makes skipping commercials a breeze. Just hit the skip ahead button once for a 30-second jump, or say 6 times for 3-minute jump. It’s a little easier than pressing fast forward and watching the commercials in fast motion on edge ready to press play in order to resume normal speed. To my knowledge the DVR’s from Fios and Dish Network are the only ones that have the skip ahead feature. Regarding the skip ahead feature… If you look at the remote provided with the Motorola QIP 6416, you won’t see one. However, as of the current firmware version, the feature IS provided, you just have to find a remote that can send the right command. The only way to do that is to either get a Harmony Remote (command is downloadable) or get any remote that can learn a command and find somebody that has a remote with THAT command. Luckily for new customers, the current remote provided will all Fios boxes is much improved and includes a skip ahead button. On to the multi-room features. I applaude Verizon for offering such a feature since this is the way of the future and it provides a better end user experience. If you get the QIP 6416/7216, it is capable of communicating with up to 6 QIP 2500’s (the regular set top box). Each 2500 can record to and watch any recorded content from the 6416/7216 (up to 3 can watch different recordings at the same time). The only problem with this feature is that currently the 6416 cannot down convert High Definition content. So any HD programming recorded will NOT be viewable on the QIP 2500’s. This should be resolved in a future software update. The Media Manager feature allows you to connect to a home computer and view photos and play music through the TV. You have to install a program on the computer that scans for compatible content. I did get this feature to work, and it can be useful, but I feel its more of a gimmick. I’ll stick to using my Logitech Music Anywhere Wireless Music System for listening to computer music in the living room. Seeing the photos on the living room TV is a neat feature, but it takes too much effort to put together slideshow each time. 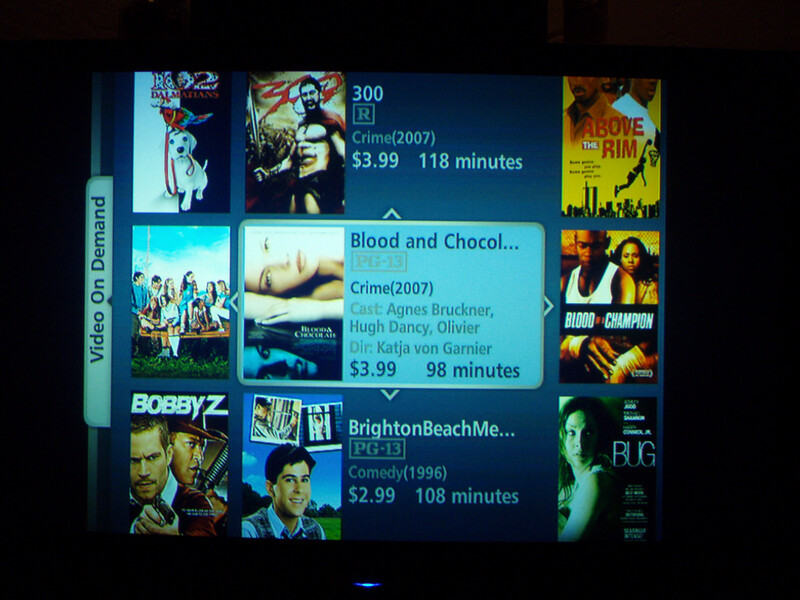 Other Features: Fios offers something called Fios widgets to expand the available features. Widgets can be setup to provide easy access to weather information, local traffic details, or your daily horoscope. There’s even an interactive widget that shows you what other Fios users in your area are watching most. With a click of a button, you can have this information appear on the screen . PIP is still a work in progress. I was not able to get it to work on my system. There are PIP buttons on the remote, and a DVR capable set top box should not have any trouble provide such a features, it just doesn’t seem to be enabled at this time. Verizon Fios is relatively new service that brings tons of features and potential. The only real downsides stem from the Motorola set top boxes. The service itself has been rock solid stable. You don’t have to worry about losing signal during rain. The method of delivery (fiber optic), in my opinion, makes it much more robust than both satellite and cable providers. If you’re looking for more reviews, be sure to read the user comments and experiences on PVRBlog. Motorola 6416 Back panel connections. Fios TV Interactive Media Guide. Fios TV Video On Demand Menu. 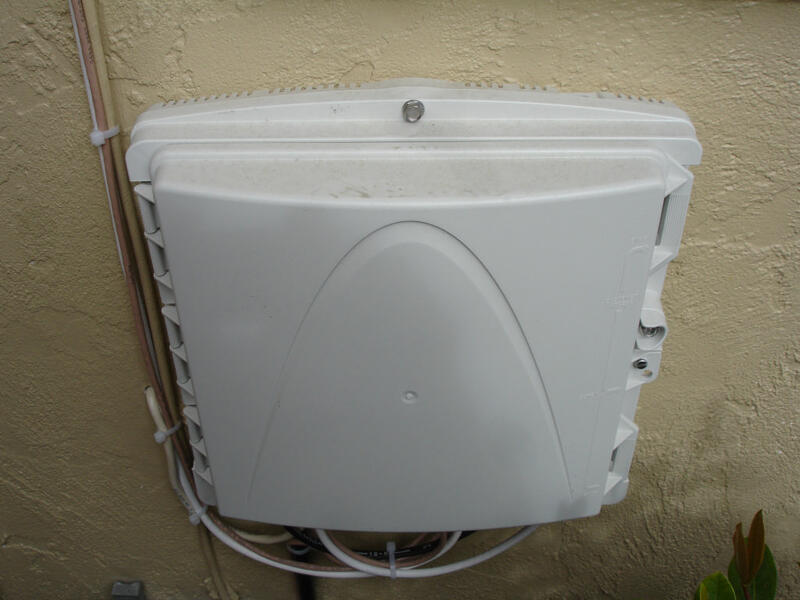 Fios Optical Network Terminal mounted on an exterior wall (open). Fios remote control (Motorola 2500, 6200, and 6416). Battery backup for Fios Optical Network Terminal mounted inside, plugged into an A/C outlet. 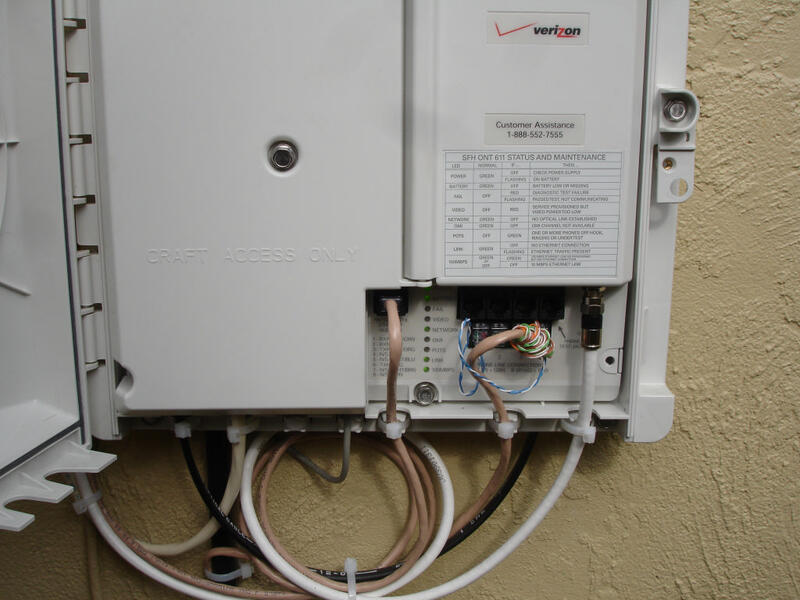 Fios Optical Network Terminal mounted on an exterior wall. We keep track of the latest offers and specials and break them down to help you get the best deal: Verizon Fios Deals. April 4, 2007 Post by Duane in Fios. Thank you so much for writing this review. Verizon came by my home today and asked if I was interested. I recently dumped Comcast’s unreliable Internet service for Verizon DSL and absolutely love it. I have had Comcast as my cable provider for 16 years. I am a bit worried about changing and receiving unreliable TV service. We also have TiVos in every room, so if the Motorola is a pain I am am worried about that also. You have my email. Can you let me know if you are still enjoying the service? Thank you. Thanks for the fantastic review. The most comprehensive one I’ve seen so far. My problem is this: While the prices look great for the 1 year introductory period, what will the price be afterward? I can’t seem to find anyone who knows. I’m interested in the complete package, tv, internet and phone. Melissa – I wouldn’t say the TV service is unreliable, in fact the service itself will likely prove to be more reliable than satellite and cable. It’s just that the HD DVR Motorola box (6416) has some shortcomings compared to my Dish 942. The content, programming, picture quality, and price do make up for it, and with each day I get more and more used to the quirks of the 6416. Michelle – From what I can tell the pricing is not introductory. The only discrepancy i see is with the internet service: free install, 1 free month, and 39.99/mo after that with 1 year contract, or $69.99 install and 39.95/mo with no contract. 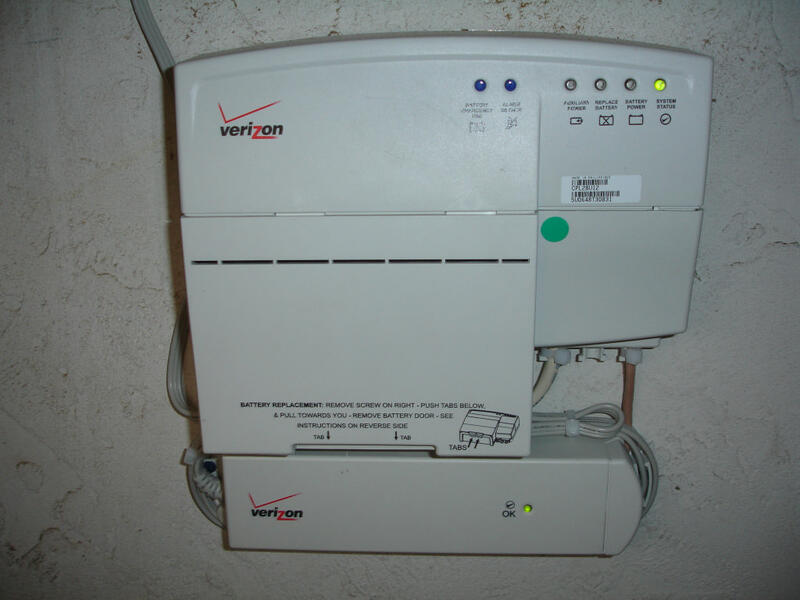 I have just had the Fios three-pak installed by Verizon and like it very much. But the remote control supplied with my QIP2500s (I have five) do not work well. The “favorites” and the “page up/down” features do not work. I discovered that my old Comcast remote URC1057 works perfectly and is a better fit for the QIP2500 than the Verizon RC1445. The Comcast remote All on feature works as well as most other buttons. It is also easier to handle and use ergonomically. One comment on the internet service – I find the service is super fast but sometimes too fast. If there is a traffic jam at the moment you try to access it will hang for you. Disconnect and try again 3 seconds later and it is blazing. I think this is an oddity of mass usage and speed. There is just so much water that can go into the tunnel before there is a backup. I switched from Comcast to FIOS last month. I do have some difficulty in getting used to the vast array of chanels compared to Comcast. The picture quality is superior to Cable. I find that the remote control is slower to respond to commands on the DVR then Comcast was. I have more chanels and a lower price then cable offered. I opted for the Movie package which has a great choice of movies on showtime and starz. I only wish that FIOS will soon have the MLB Extra Innings Package available. Switched from Comcast to FIOS in Feb 2007. FIOS is better for me by far. I nominate Comcast as the world’s worst service organization and that poor service finally pushed me to change after over 10 years with Comcast. Now I have better TV and high-speed internet and save a few bucks a month in the process. Life is good! Great information. I just had FIOS installed yesterday. I live in baltimore County and was according to the tech the second person in the neighborhood. Can any advise me on how I can use a HF remote instead of the infra red one supplied with the FIOS Motorola QIP-6416 set top box. My box is inside a cubboard and I have to leave the door open to access the functionality I need. Andrew – As far as I know the Motorola boxes do not have UHF functionality (its not too common). In order to control your equipment in a closed cabinet, or another room, you would need to purchase a UHF remote and an RF extender/sender. The Logitech Harmony 890 along with the RF wireless extender would accomplish this. Excellent review! I see that we’re neighbors. Recently Verizon installed the fiber in my subdivision, but they haven’t activated the service yet. I’ve been debating whether to switch from DirecTV when it becomes available. I’ve got a dedicated home theater in which I use a DirecTV HD TiVo. Although I’m not satisfied with the number of HD channels, I’m pretty happy with the TiVo DVR and satisfied with signal quality. In my family room I have an old, first generation HDTV that uses RGBHV for its HD input. Its hooked up to an old RCA HD DirecTV receiver via a VGA to RGBHV breakout cable. This arrangement has been working flawlessly since 1999. In addition to wondering whether the new Fios TV service is ready for “primetime”, I’m concerned about the fact that the new Verizon HD DVR does not have an VGA output that I can attach to my older HDTV. From your review I gather that I shouldn’t be unduely concerned about early growing pains regarding the new Verizon HD DVR or the service reliability, quality, etc? How about connecting to my old HDTV? Any words of wisdom? By the way, I’d love to show you my setup. Shoot me an email if you’re interested in dropping by. Hi Larry! Be sure to keep checking online for Fios availability. Once they come through the neighborhood, it should be active soon after. I was actually waiting to see them pulling fiber in all the conduits, but it turns out, they don’t actually pull the fiber, until somebody orders Fios. Each house gets its own fiber line (from the hub in the area). I didn’t try ordering until I saw one of my neighbors getting it, and this was well before I received any official notice from Verizon. The Motorola HD Fios box does have YPrPb outputs, so check to see if your old HDTV has any RGB/Component/YPrPb inputs. Otherwise you could get a YPrPb to RGBHV converter. I believe Fios offers more national HD channels than any other provider other than Dish Network when you include their exclusive VOOM channels. I must say that my experience has been quite satisfying, and I wouldn’t worry much about the shortcomings of the Motorola. In addition, Verizon will soon release the all new Interactive Media Guide, which will have a huge impact on user interactivity, hopefully for the best. More on that soon. I have a house under contract that Fios is available but I have two Series 2 TiVO machines that I would like to continue to use. Currently I have Comcast analog service and the TiVOs work perfectly. Does anyone know if the digital boxes are controllable by TiVO? Currently I have Comcast tv on 3 rooms, with one being digital and the others being analog. I’m interested in getting Verizon fios tv, internet, and phone, and would like to have the fios tv in 4 rooms. Duane, do you (or anyone) know what the cost comparison is for Comcast tv vs Verizon tv for multiple rooms? I can’t seem to find this info. Thanks. Steven – TiVO should work with Fios, but channel changing will be slow (using TiVO supplied IR cables to control Fios box), and I’m not sure what programming guide data you’ll be able to get. Also, unless you have a lifetime subscription, it may not be worth paying the monthly TiVO subscription on top of Fios. Frank – Fios TV installation will enable a limited set of analog channels (about 15), which would be available to any TV in your house. In order to get the full set of programming, you would need a STB (set top box) on each TV you wanted full programming. The basic STB is $3.95 per month each. The HD/DVR STB is $12.95-$15.95 per month each. how do you connect a dvd to fios tv? Has anyone had a problem with the fan on the Motorola 6416 running constantly? We don’t know if this is normal or if we have a problem with our box. I am a Verizon fios installer from Ma. I enjoy installing it at customers homes. I like reading the reviews from this site just to see what people are saying from outside the box . Thank you so much for this review, it was extremely helpful. I am currently with Comcast cable, but have Verizon phone and DSL, so I have been debating on which company to stick with for our services because I know they both have a bundle package. This has really gotten me excited about Fios and getting a bundle package for all of our services. Thanks for the review and information! Does anyone know if you can purchase the Motorola QIP-2500s from a third party? I don’t relish the idea of paying $5/month per TV for a converter box. In the long run it’d be cheaper to buy a converter. Anybody try using a dvd recorder to make dvd copies of programs stored on the motorola DVR. I appreciate all the good info. Any idea what analog channels will be available on Fios? I have several tvs that are mounted on the wall, and hooking a set-top box up to them isn’t a very desireable option (if even possible). This is really the only concern that is keeping me with Comcast. I’m actually a little surprised it isn’t a more discussed issue. I just ordered this service today. I’m wondering how big the hard drive is? Any spec on max recording times? Analog Channels: It appears that all of the local channels are broadcasted from the ONT. For me this equates to about 19 channels including the new Weatherscan local weather channel and a TV Guide channel. To receive any national channels, you would need a set top box or cable card. Hard Drive Capacity: The hard drive is 160 GB, which is plenty for SD programming, but is only about 15 hours or so of HD content. The HD content is compressed less than other providers so this would account for the less than stellar HD capacity. Your review was awesome. Hopefully you will think that the following is helpful. First and foremost let me say that I do NOT, directly or indirectly, speak for Verizon. The suggestions that I offer should be taken as helpful hints from one friend to another to maximize your Fios installation experience. 1) Technicians call ahead before their arrival. It is helpful if you answer the phone! Sounds simple right? For some maybe, but for others this seems to be a real challenge. 2) Contain your excitement when they arrive by NOT going out to meet them at their truck. Often there is some paperwork that needs to be filled out, and components to be gathered. Nothing gets you off on the wrong foot faster than interrupting someone trying to get things together with “are you here to install my Fios?”. Trust me that nobody is trying to make you wait any longer than you absolutely have to. 3) Trying to give a Gratuity before work begins is not sincere appreciation but rather an attempt at a bribe. Trust me that the technician knows how important this is to you and MOST will do everything in their power to make it the best it can be for you. The installers are generally high end and the most experienced technicians from a given garage. 4) Plan ahead! There is going to be a new router put in by your computer and CAT 5e wire run from the ONT to a data jack next to your computer. Please clean up around your computer. NOTHING is worse than working in an area so covered in dust bunnies that you know that nobody has vaccuumed for a while. Also Fios requires electricity. Look around close to where your existing phone box (NID) is located and see if there is an outlet somewhere close to it. This is where the tech is most likely to mount your new ONT. Once you find the outlet, make sure the technician has easy access to it without having to clean anything off. If the outlet is already occupied with your washer and dryer, then invest the five bucks for a power strip. It is also a good idea to prep your computer for the new service by dumping temp internet files and defragging before the tech arrives so that it is running at its peak performance. 5) During the installation. Most techs I know do NOT care if you stand over their shoulder or choose to go do something else while they work. Try to pick one and stick with it. If you choose to go elesewhere make sure you are readily available in case there is a question for you. If you choose to stay with the technician, silence is golden. Questions are fine, but should be asked BEFORE the work commences. Of course you may think of one as you are going along and that is fine. What drives techs to drink is when they are peppered with a never-ending stream of inane questions while they are trying to work. The work is in some places requires meticulous attention to details that just cannot be properly given if you interrupt the work by asking if this service is really faster than the local cable company. Also if you stay with the technician, be helpful. Often times the tech can use a paper towel or something cold to drink (esp. if he has been at it a while or its an especially difficult wire run). Use your best judgment on this one, but dont be afraid to offer a drink or a rag or whatever if you think it will help. Even if he does not take you up on it, the tech will be grateful that you had the prescence of mind to offer. 6) Dont panic if everything doesnt click on the first shot. Test everything before the technician leaves and know that if something isnt just the way you want it, then it can be made that way. One call to the Fiber Solutions Center fixes 99 % of the problems on the first shot. I am a FIOS tech in SW Florida. The hard drive on your 6416 is 160Gb. You can record 120 hours of standard def tv or 20 hours of HD tv. Regarding #4 in your post. The wirelss router we NOW use takes a coax input (or cat5 if you prefer). It can be hardwired via ethernet to your computer (it has 4 ethernet outputs) or you can use it wireless. The wireless also comes out of the box with security enabled so that others cannot access the router’s internet without your permission. I am also a Fios technician in New York. I am aware that some folks do use the moca, but we still use the Cat5e. And although some subs want the router placed somewhere out of the way (e.g. the basement) because they plan on going wireless, the overwhelming vast majority of people still get the router placed next to their computer. FYI The default encryption for the wireless router is WEP, which is very easy to break. The newer routers are also WPA capable, but you have to go inside the router and change that setting. Again let me preface everything that I am going to say by stating that I do NOT speak, directly or indirectly, for Verizon. Appt Buildings are a real slow go because of the logistics of it all. My understanding of the process is that there are primarily two alternatives. 1) Newer buildings are now prewired with the necessary cables to carry the Fios service from the basement terminals to each individual appt. just the way we do copper now. 2) Older buildings (which you probably fall into) have to be retro-fitted much in the way your building delivers cable TV service (i.e. a serving box on each floor with wires running from it in the cable chase to each individual appt.). Of course this is a costly procedure and each individual building owner has to give his OK to do this process. If I were in your shoes and wanted the service I would approach the super and/or the owner and ask them if they have been approached by Verizon to wire their building up for Fios. If they have not then see if the owner is open to approaching Verizon. If they have and are just being recalcitrant, then talk to your neighbors because if enough of you want it…you never know. well according to verizon i was qualified so we must have a box somewhere around here!! Does anyone know if you can purchase the Motorola QIP-2500s from a third party (i.e. ebay)? I don’t relish the idea of paying $5/month per TV for a converter box. In the long run it’d be cheaper to buy a converter. I’m not aware of any options to purchase fios stb’s. There have been some for sale on ebay, but I’m not sure if they can be used without monthly charges. Fios does allow you to use any Digital Cable compatible cable card to receive digital channels. However, since part of the service is provided over IP, use of a cable card would reduce the features available, like video on demand, interactive guide, etc. I’ve also heard that Verizon’s will lease cable cards for Fios. Just got FIOS tv/internet hooked up this week. I love it. I too am a Dish refugee. One of my LNBs has been dying a slow painful death, taking out all the channels on Sat. 119, even transponders, for the past 3 months. I knew Fios was coming and didn’t want to pay to fix the Dish. Did I mention I love Fios? The broadband internet has most recently clocked at 5 MBPS down and 1.5 up. Earlier this week, it was 4 down and 2 up. I was on dialup before, like I’m going to complain? The picture quality of SD channels is par or better than Dish. The HD channels look just ever the slightest wee bit softer to me. (I have recently used a Samsung ATSC tuner for local HD channels, which has incredible HD picture quality … the best I’ve seen). I have yet to see a single MPEG compression artifact. These were common (though not frequent) in Dish HD broadcasts. So far, Verizon is doing everything right. I hope they don’t become another Comcast. I lived without broadband internet these past few years because I refuse to deal with the horrible customer service of Comcast. Thanks to the Verizon techs who have popped in on the thread to provide details. I love you guys. In my experience, compared to Dish, the usability of Fios is not as good. Verizon keeps saying they are fixing the glitches, but so far nothing has changed. I have the most problems with fast forwarding – especially skipping ahead 30 seconds. Also, the channel guide isn’t as neat and pretty as Dish. Calling Verizon for any reason makes me want to pull out all my hair. Calls generally last over an hour (most of that time spent on hold), I’m constantly being transfered to another department, and calls are mysteriously “dropped.” Generally my problems are solved in the end, but not without causing major frustration. I am hoping with their planned upcoming changes, Fios will be by the far the best option out there. Does fios tv and internet share the same bandwidth ?? I am wondering if internet speeds are consistant without fios tv eating my badwidth for whatever reason. ACE, are you using the 888-553-1555 number when you call Verizon? I had to call them once: couldn’t log onto the router initially (tech didn’t provide password), aspect ratio on tv was set incorrectly, and HD channels weren’t activated … tech support was downright delightful and answered all the hardware-related questions without having to resort to the mindless scripted troubleshooting … she knew her product information. 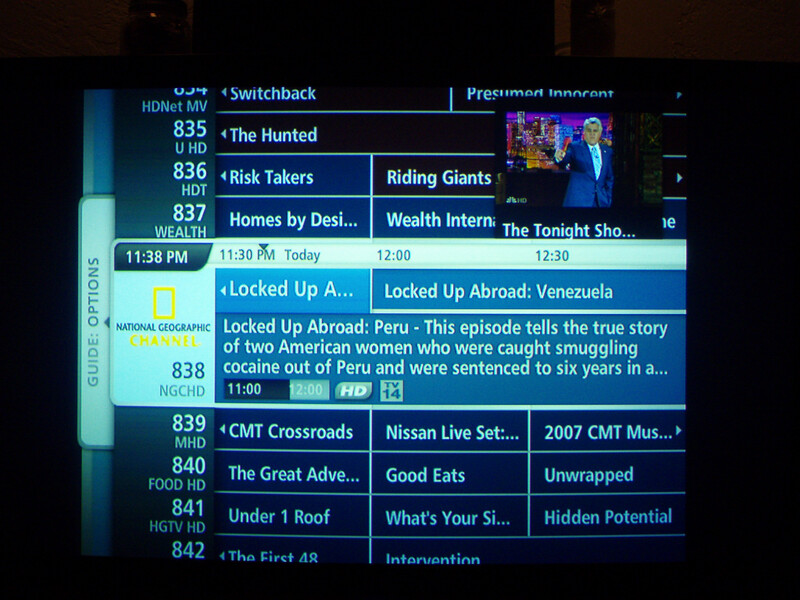 Once transfer to get the HD programming activated, a common glitch in new installs with the HD/DVR. I am surprised at your problems, because Customer Service is, so far, the best part of my Fios experience. Jerry, my understanding is that each Fios service uses a different wavelength. I’m sure one of our tech visitors here can confirm. LJK, thanks for the 888 number, I’m not sure what numbers I was using. Most of my calls to Verizon have been regarding website and account (billing) issues. I’m happy to know that I can look forward to great tech support if I have technical problems/questions. I switched from Comcast about a month ago. No major problems with the install and performance ( I have triple play). Works great!! However,I do have an outside issue with the remote used with the STB. I have two STB (Motorola)to allow Hi Def viewing on two TV we have that are Hi Def. The remotes should be universal and operate all your video devices. I have ran into a snag finding the code for Audiovox (Model No FPE2706DV)TV. I can not find the code that will work for this TV on the Motorola remote. I have exhausted all references I know of (The Internet, Motorola remote codes & Audivox). The Fios tech even tried another Motorola remote on the outside chance it was defective.. Have any of you Fios techs ran into this trouble? Also, is there some sort of universal code that can be used? Using two reotes is a bit of a pain. Get information, thank you for all the work! I have four TV sets and was wondering how you would go about connecting the other sets for just basic channels? I am currently using the triple play with cablevision,on Lond Island,and having horrible problems with the phone and internet service. Since adding the phome service I havce dropped calls and lose internet connection and phone service quite often through out the day.I am wondering if anyone is experiencing these problems with verizon’s triple play. IM thinking about getting Fios tv. What are the pros and cons? Does anyone know if the Motorola QIP 6200 box (I already have a TiVo) have a HDMI output? FIOS TV just recently became available in the Delaware area and I just switched off Comcast cable and internet today as the Verizon tech installed a load of hardware in my garage wall. W-O-W. The picture is A LOT better than cable. A few channels that I’ve had problems with Comcast like Food Channel are crystal clear and almost HD-like for a standard television. The only discomfort was the jumbling of the channels. The line-up I had memorized from a few years of surfing had crashed on the rocks and rearranged. LOL It’ll take some getting used to but all my favorite channels are there. I especially like the Favorites function over Comcast’s. To be able to see in text what’s currently on each of your favorites is nice instead of scanning each channel. I only have the standard Motorola set-top boxes. I don’t need the DVR because I already own a Panasonic DVR with a 100GB HDD. The only problem with FIOS is currently there is no TV Guide channel and my DVR needs access to that channel in order to update it’s guide schedule but I’m sure it’s coming. It’s hard to form a full opinion on the service since it’s so new in my area but the first impression was more impressive than my constant service disconnection from Comcast. Having all your TV, internet and phone on one bill is convenient too. Sparky, local channels can be received on any tv through your existing coaxial wiring. Hello – I just got FIOS today. Does anybody know if the Motorola QIP-6416 box offers an auto-select feature between 720p/1080i programming? I tried pressing the Menu/Guide buttons simultaneously to go to the set up screen, but the only option was to select either 1080i or 720p, but no auto-selection (I watch a lot of ESPN, which broadcasts in 720p, so I’d like to see programming in their original aspect). Does Verizon plan to introduce a box that offers this feature (my old TimeWarner box had this feature). This thread has been very informative; thanks for all the information! My area is getting Fios in a couple of weeks and I am planning to make the switch from Comcast. I have gotten the impression that they remove some of the coax from Comcast, so that if we decided to go back to Comcast, it would either be impossible or very expensive. I don’t think we’d want to switch back, but I’d like to understand what I’m getting with Fios. And, along with everything else; what if there’s 10 TV’s in one house? What’s the limit for this first generation of Fios? Having just had my FIOS TV install completed this week, I think i can answer a couple of questions here. #48 DMK. reference the same picture, there is RF in and RF out. #51 Rick J. With 10 TV’s, you need to be concerned with signal loss. There is 1, and only one connection on the ONT (the box they install outside). They will bring a coax into a splitter. they will then run a coax to each tv location (more than 3 runs cost $$, as well as the router. Yes you can get basic cable stations without the STB. I’m doing that in two rooms, have 2 2500’s and one 6200 with a TIVO Series 2 doing my recording. hi, which is better, Cablevision’s IO digital cable or Verizon’s “so-called” Fios? I would say the cablevision is more user friendly and has state of the art cable. They offer faster internet connect speeds for metro users( approx. 2xs as fast) When you deal with fios you are dealing with the phone One ringy dingy! They are not in a hurry to update the system nor to make obvious problems in equipement changed. It appears the problems in the New York area in particular is the never ending war of the Unions verse Verizon and verizons need to make all changes cash flow positive immediately rather than improving the service and let it become profitable due to its prefference by consumers. I think it will have lots of churn as directv and cable offer better content at a lower price. We just had Fios installed at our house (phone, tv, computer). The picture is incredible! But we bought an LG DVD recorder and we can not get it to work with the set top box – it is not picking up the channels – I spent over an hour with the LG guys who told me the problem is with the set top box – the fact being that we can not plug into the IR function in the box. Is there another way to get this to work? I purchased a QIP2500 on ebay and plugged it in. It worked for about a month and then went ‘dead’. Turns out Verizon tracks each box by serial number, and so they can turn it off whenever they want. So, they won’t support the box, even if you purchased a compatible unit from a third party. You HAVE to use their rental program. Does anybody know when Fios will be available in Culpeper VA? I think I wanna get it but for the past couple of months, Verizon says its not yet available in my area. I left DISH about 2 months ago and changed to the FIOS service in Sarasota. I miss the DISH HD DVR, it was very intuitive and makes the FIOS look more like something offfered by the local cable comapnay. I thnk FIOS also has resolution problems when set to 1080i. I don’t have FIOS in my area yet, but as far as an answer to the cablevision question – it is cheaper, but it uses copper lines instead of the fiber optics, with FIOS I’m sure you get more bandwith. Plus I’ve heard that if you do major downloading or uploading with Cablevision, they Cap your internet speed, so the 15Mbps service you’re paying for would only be 4-5, and apparently that happens a lot, even with their business plans. I can’t wait for FIOS to come in my area. Oh and to answer a question that was asked a long time ago, I don’t think you can purchase the set-top boxes, Motorola has them leased out to Verizon specifically for this service. Oh and with the question about 10 televisions, I know Verizon with only connect up to 7, but after that it’s up to your judgement on using splitters and such, or making the decision on if you need all 10 televisions connected to the boxes. HBO and 2 boxes for $126/2yr contract. What is the best deal??? Without any special setups, Fios TV will support up to 7 STB’s. Adding more than 7 STB’s can be accomplished in one of two ways: Adding a second ONT or adding by adding a NIM and an AMP. I have heard of both being done in South Jersey. I just switched from comcast to verizon fios, I like it because it is cheaper for me but I find there are some features or lack of features disappointing. Such as: the remote control is slower compared to comcast,on demand is more difficult to maneuver through to find programs, it does not offer programing to set a reminder for a upcoming movie or show like comcast. It does not offer all programs on different channels such as TBS, TNT etc. to view missed episodes. It should not be a great maze to get through to find what you are looking for, it should be more simpler to maneuver through. (like comcast) But I am happy I got it I just hope it will be more user friendly. I notived that Verizon (a telephone company) does not offer an on-screen caller ID like Dish Network (a satelite TV company) does. How am I going to avoid all those telemarketers and campaign callers? Any status on Lakeland? I live off of New Jersey road and saw that fiber was buried about 2 months ago. Really hoping for Fios. Anyone know if FIOS is available near Watertown, NY? And if they are planning to install in that area anytime soon? I ran rg6 coax to each outlet in my house of which 6 may be needed. How will the tech hook into this? Let me be more specific. I ran one cable per outlet, which means I have 8 cables that are stubbed out in my garage. 6 are active. Can the tech work with this configuration and will there be any extra equipment needed? Does anyone know if the Motorola QIP 620-6 is compatible with a TiVo DRT800 (non-HD)? Humax, the maker of the DRT800, tells me it is not. I have been trying to get the three units – QIP 6200-6, DRT800 and a Sony HDTV – configured properly so I can record a different channel from that which I’m watching, without success. I’ve talked to TiVo/Humax numerous times and tried all their wiring suggestions, Sony’s op manual, and my own sense of what should do the trick. But nothing works. Humax/TiVo last told me it’s probably because the technology in my 2004-vintage TiVo is not compatible with the QIP 6200-6. If I’m watching one channel when a TiVo recording starts on another channel, the channel I’m watching is changed to the recording channel. Conversely, if the TiVo is recording on one channel and I turn on another channel to watch, the TiVo will switch to the channel I’m watching. Can anyone help me? Thanks. This looks like a good deal considering Comcast just jacked the prices up even more. That after already raising the prices. Comcast is now over $50 and has less channels. Since we only have basic cable this seems like a great step up but I’m just mad that they don’t have it in my area yet. Do you think I will get it soon. I assume so because people have already had it since april. Comcast rein of terror on the cable world will be dimished soon I hope. I heard some complaints about it not being as user frindley but I can adapt quick and it shouldn’t be a problem. Just can’t wait to get it. Comments for this post are being continued at: Fios Forum. Please post your questions and comments over there. Gary and Kelly: Check out my new post on the new Fios Interactive Media Guide. It changes everything about the Fios interaction. Ron Gregg: With the QIP6200, you will only be able to tune to one program at a time. This box, like all non-dvr boxes has only 1 tuner. If your TiVO is recording something, the QIP6200 must be tuned to that channel. I recommend upgrading to the QIP 6416. It’s only $3 more per month than the 6200. Jeff Gold – FIOS has much better content than Cablevision, more channels, much better picture quality, faster internet (20 mbps download, while cable struggles for 8 or 9m on a good day), FREE on demand, and of course the ability to expand as new technolgy becomes available. 80 hi-def channels expected by Spring ’08, oh yeah, Cable can’t really add more hi-def without deleting some existing channels because they don’t have the BANDWIDTH. Live and learn, and get FIOS. To recap, I have everything Verizon offers. My house was recently built and wired up for fiber optics. I have TV, internet and voice. – On a standard TV, Fios’s picture quality is superior to that of Comcast’s. Connecting a SDTV directly to the coax in the wall, the local channels still came in great. – Fios recently updated their user interface. It’s a lot user friendly now although I was used to the old interface but it grew on me. This interface is also a lot easier to use than Comcast’s and more informative. – I recently purchased an HD LCD TV with 1080i resolution. I updated one of my STBs with Verizon’s HD STB. (This was a self-install which you will read about in my cons subject) Once this STB was up and running, WOW. All channels look a LOT better. – When I had Comcast, I could watch a lot more channels when connecting a TV straight to the coax outlet which I do in my kitchen where I don’t have space for a Fios STB. When connecting straight to a Fios connection without a STB, you get a very limited number of channels. I can no longer watch Food Network in the kitchen like I used to be able to with Comcast. – SELF INSTALLS. The WORST experience I’ve EVER HAD with Verizon. If I have this kind of attitude ever again from the FSC, they’ll find all my STBs and cabling from my house strewn all over their parking lot. I ordered an HD STB from the Verizon website. It arrived a few days later with VERY simple instructions on how to set it up. After getting the box connected you call Verizon and provide an activation code that came with the STB and you’re ready to rock. Well, not in my case. I couldn’t watch anything on this box except local and the HD channels (HD channels include about 13 channels, the HD national channels require you to pump out more money to Verizon to watch although nothing about this is mentioned on their website.) I was on day and night with techs trying to get this box to let me watch the Fios Premier package that I’ve been subscribed to for a year, but nothing worked. I had 3 techs come out to the house and swap boxes out bu that didn’t work either. The last tech got on the phone with some woman from Verizon (over speakerphone) and in her mean tone of voice, made me sound like I was a moron and there was no problem with the box and that my service wouldn’t be activated until a week later. I told the tech this was BS and how can I wait for a service to be activated when I’ve been subscribed to it for a year? I was pretty ticked off then. I waited until the day that woman said my service would be activated. Guess what? I’m not the moron she thinks I am cause I STILL didn’t have service. Then, a great tech came out on his day off to figure this out and found the problem. My account was messed up by the person trying to activate my box and it wasn’t allowing my programming to come through. MY ADVICE: IF you do a self-install when you upgrade, let whoever you call at Verizon know that it’s a self install. This was strike 1 for Verizon, if there’s a strike 2, I’ll go back to Comcast cable. – I own a Panasonic DVR with HDD that uses TV Guide signals over cable to update it’s programming guide and make it easy to set up my shows to record. Althgouh this is just a minor inconvenience, I can set my box manually to record. This DVR worked over Comcast cable, but it won’t recieve the needed signal over Fios for some reason. Again, no biggie. – FAST. I have a 15mb down, 2mb up connection. This isn’t the fastest they have either but this satisfies my needs greatly. – Comcast voice, when Comcast goes out, so does your phone. If Fios goes out (yet to see that) you have a battery back-up to last you for a few hours (or more, not sure). Overall, Fios is a big step up from Comcast and I’m a happy customer. Although whatever department that gave my visiting techs a hard time with my self-install should get a swift kick in the pants, I’m willing to look past that one instance and enjoy my service. #1. What is the best way to provide the FIOS TV signal to a TV in a kitchen with no TV jack (it does have an Internet jack, and power of course)? #2. Does anyone know when FIOS TV will be available in Victorville, California (I currently have FIOS telephone and Internet service—both are excellent. Duane, thank you for excellent review. I installed Verizon FIOS bundle ($99/month for 2 years + STB box $4.99) a few days ago after Comcast hiked my price almost 100%. Installation was smooth, and I had no interruptions in internet, voice or Tv service since then. The only drawback that for this price Verizon gives you only local and Premier packages, which is pretty much a lot, a lot of junk channels. In order to get some limited movie channels, you should pay $20 more, which makes the total price not that competetive. I have had Fios now for about three years now. About 4 months ago, I received a free up grade on my Internet speed to 20mbs up and 20mbs down. As an avid gamer, I set up a server so my brothers and I could take on all comers. When Fios rolled out it’s extreme HD package, I had to reduce the Internet bandwidth to 20 down and 5 up. Verizon service is excellent. Their tech arrived in about three hours, my guide was not updating (cable box was bad), installed a new router, replaced the remotes on both of the DVR’s. He also redid a couple of cable connectors that were poorly done, OK, I was in a hurry and it was a bit sloppy!! The decision to limit the bandwidth for bundles still bugs me, but Fios is still the best game in town. Just got my FIOS. Wow. Great picture. Superior to cable. Fast internet. Phone great. I installed Fios bundle 6 Month ago I had bad expriance withen the last 6 month i had to call 7 times for repair, Technician never came on time. I don’t think Fios bundle is not good idea when ever have proplem your phone service internate and Cable stop working one time. Verizon has updated the widgets to include Weather, Traffic, News Headlines, sports headlines, Fantasy football, What’s hot on FiosTV, What’s hot on demand, and horoscopes. The STB (2500, 6200, 6416, 7100, and 7216) are all fully compatible with TiVO but you must purchase a separate infrared cable to complete the conversion. What is the total monthly bill for FIOS bungle with one STB box with all “surcharges” and “taxes” included? When is verizon going to let us plug in our own hard drives so we can recored on it.it has a usb connection on it but it does not see the drive. Martin – For whatever reason this feature has not been enabled. I hope that they add this capability soon!